Facilitating a two-day Mod Mood Quilt Workshop for the Orange County Modern Quilt Guild (they have more photos on their site) was fantastic! There were 16 students in the class, including a large contingency from the LAMQG. I was so impressed by their energy, community spirit, and creative capacity. Everyone worked so hard. I couldn't believe how much they achieved in two days. As the images progress, notice how the workshop space gradually explodes with color! The highlights included beginning each session with a cognitive centering exercise, a guided meditation for grounding, centering, and emotional color scanning. We connected to color in a meaningful way and created lots of wedge-shaped curves on day one. On day two we broke into four teams and made massive color puzzles using everyone's curves, on the four large work walls at the Sewing Party, where the workshop was held. Finally the hard work set in as each person worked with their own curve sections to begin composing their quilts. Unfortunately I was so busy helping people I forgot to take pictures of everyone's individual compositions, but I could see the signatures of each person emerging. Hopefully my lovely talented students will share their in-progress and finished quilts on the Mod-Mood Quilt Flickr Pool. I can be my own worst critic. Learning to let go of expectations really helped. I loved the centering exercise and was surprised at my color choices afterwards. I struggle with bringing out my creativity. You are very encouraging and calming. Nothing can't be worked out. It was refreshing not to worry about the long-term impact of my early decisions - great to stay in the present, and not worry about the future. My favorite part was learning to enjoy being creative w/o too many rules. I liked the whole process and found myself pushing ahead even if I was unsure. 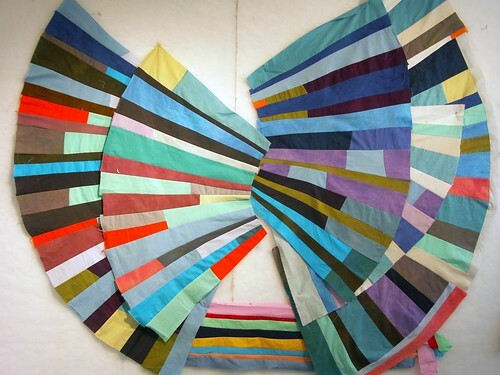 I learned so much, about not only how to construct the quilt, but also about myself and life. Thanks to all my fabulous students! Very special thanks to Yolanda at OCMQG for inviting me and making this all happen, to the LAMQG for supporting their sisters in the south, and to Bunnie, my gracious and talented host! PS - I hope you will all stay in touch! So I do LOVE to teach, and I would LOVE to bring one of my improv quilting workshops to your neck of the woods. Contact me, share this post with your guild organizers, or your local quilt shop, my schedule is open! Get Your Curve On: 510A Friday, February 22 – 9 a.m.-5 p.m.
Improv Round Robin: 512A Saturday, February 23 – 9 a.m.-5 p.m.
Modern Block Improv: 513A Thursday, February 21 – 9 a.m.-5 p.m.